India today pledged full support to Nepal in its struggle against Maoist terrorism and also observed that New Delhi considered a the constitutional monarchy and the multi-party system as the two pillars of democracy in the kingdom. Nepal’s King Gyanendra meets President K. R. Narayanan at Rashtrapati Bhavan in New Delhi on Monday. Shahi Imam of Jama Masjid Syed Ahmed Bukhari today flayed the Vishwa Hindu Parishad for refusing to accept the court verdict on the Ayodhya issue and demanding division of Jammu and Kashmir. After another round of questioning, the Time magazine’s India correspondent Alex Perry, whose news report on the health of Prime Minister Atal Behari Vajpayee has created an uproar, appears to have been let off by the immigration authorities “for the time being”. The Election Commission is not to move the Supreme Court to seek more time to meet the apex court’s deadline of July 1 to ask candidates to give information on criminal records and assets while filing nominations. 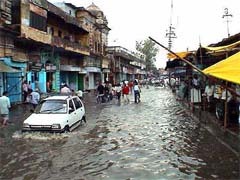 Tension gripped the Amber Road area in the city this afternoon when Jaipur Development Authority officials attempted to attach a disputed plot under the control of Reta-ki-Masjid, a senior police official said. A youth was critically injured when mob violence erupted in the Junigadi and Lalakhada areas here late last night after two persons belonging to different communities had an altercation and exchanged blows. India today denied that it had received the modified version of the SU-30 MK-I fighter aircraft from Russia. An IAF spokesperson here said they were still to get the physical delivery of the SU-30 MK-I aircraft here in India. Five Peoples War Group leaders wanted in several cases, including murder, were arrested during a police swoop in North 24 Parganas and West Midnapore districts of West Bengal, a senior police official said today. ‘Fairy Queen’, the world’s oldest steam locomotive in running condition, chugged off here today for a nostalgic 100 km journey to Pali. In a gruesome incident, a man killed his brother for three inches of land at Nagla village under the Bakewar police circle yesterday, the police said today. Aftab Shivdasani, an actor who has made a transition from a child artiste to model and then to a leading actor, smoothly. 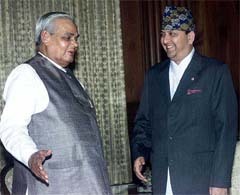 Prime Minister Atal Bihari Vajpayee with King Gyanendra at Rashtrapati Bhavan in New Delhi. 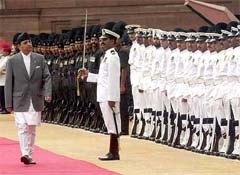 King Gyanendra inspects a guard of honour during his ceremonial reception in the forecourt of Rashtrapati Bhavan. India today pledged full support to Nepal in its struggle against Maoist terrorism and also obersved that New Delhi considered a the constitutional monarchy and the multi-party system as the two pillars of democracy in the kingdom. Nepal, on its part, expressed gratitude to India for its continued moral and material support in dealing with the Maoist violence as the visiting Nepal King Gyandendra Bir Bikram Shah Dev told External Affairs Minister Jaswant Singh that “Nepal greatly appreciates the moral and material support rendered to us by India in the fight against terrorism”. The King, who arrived here last night, was accorded a ceremonial welcome at the forecourt of Rashtrapati Bhavan this morning. Later, Vice-President Krishan Kant and his wife called on the King, who is on his first visit abroad after ascending the throne last year. A spokesperson for the Ministry of External Affairs Ministry said the Indian leaders assured the King that New Delhi remained committed to do whatever possible to assist Nepal in grappling with the problems being faced by the Himalayan nation. Both countries have committed themselves not to allow their respective territories to be used for activities directed against each other. Asked to comment on reports that a powerful section in India had reservations about the role of monarchy in the kingdom, the spokesperson said: “We certainly do not share that view...we consider a constitutional monarchy and a multi-party system as the two pillars of democracy in the neighbouring country”. 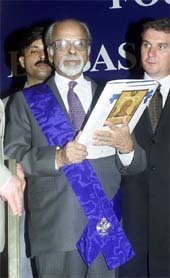 The spokesperson said India attached special importance to the visit of the king, which was reflected by the fact that Prime Minister Atal Behari Vajpayee had done away with protocol by hosting an exclusive dinner for the monarch, over and above the ceremonial banquet in the King’s honour by President K.R . Narayanan. Shahi Imam of Jama Masjid Syed Ahmed Bukhari today flayed the Vishwa Hindu Parishad (VHP) for refusing to accept the court verdict on the Ayodhya issue and demanding division of Jammu and Kashmir. “Such provocative statements were dangerous for the unity of the country,” he said in a statement here. Syed Ahmed Bukahari said it was the duty of the government to respect the verdict of the court. The government should be firm in dealing with such forces which ignore judicial decisions. On the demand of the VHP to divide Jammu and Kashmir into four parts, he said the proposal was detrimental to the unity of the country. HYDERABAD: The All-India Christian Council on Monday deplored the statement of VHP leaders that they will not adhere to the Supreme Court verdict on the Ayodhya dispute and described it “highly alarming”. In a statement here, AICC President Dr Joseph D’Souza and Secretary Sam Paul urged the Prime Minister Mr Atal Behari Vajpayee to initiate action against the VHP leaders for “mocking” at the judiciary. “The open defiance of the judiciary and the anarchy that the VHP is likely to create by mobilising the masses from the second week of July should be looked into by the Prime Minister. The threats of disobeying the law should be nipped in the bud before they get out of control”, they added. Perry, who had been summoned to the office of Foreigners Regional Registration Office (FRRO) here this morning, the second time in four days, was questioned for 10 minutes before being told that he was not required for the time being, according to his counsel Lalit Bhasin. Perry, however, was asked to inform the FRRO as and when he leaves the country as “matter of Courtesy”. Bhasin said that he was questioned by Joint Director (Immigration) K.S. Bains and Deputy Director (Immigration) P.K. Bhardawaj. Perry, who was summoned for possessing three British passports, also handed over a letter from the British High Commission which stated that he was holding a valid passport. The magazine has also reportedly agreed for publishing a rejoinder in its next issue. The Election Commission is not to move the Supreme Court to seek more time to meet the apex court’s deadline of July 1 to ask candidates to give information on criminal records and assets while filing nominations. The Election Commission had been informed that the government intended to hold an all-party meeting on this important issue in July. In the meanwhile, the EC has decided not to move the apex court to extend the July 1 deadline, commission sources said. “The government is also a party before the Supreme Court in the case and can move it to extend the deadline if it so desires,’’ they added. The Supreme Court, on May 2, had asked the Election Commission to issue an appropriate direction under Article 324 of the Constitution requiring each candidate to file an affidavit as part of nomination papers. Tension gripped the Amber Road area in the city this afternoon when Jaipur Development Authority (JDA) officials attempted to attach a disputed plot under the control of Reta-ki-Masjid, a senior police official said. Hundreds of Muslims gathered in the area and put up blockades on Jalmahal Road as the JDA team started felling trees in the ‘mazar’ area of the mosque after putting up a board of property attachment, Deputy Inspector-General of Police Ajit Singh told PTI. Timely action by the police contained the tension, he said, adding that the JDA Commissioner was immediately contacted and a meeting was held between the two sides to resolve the issue. Sachin Kayasth (24) was rushed to the SSG hospital with multiple injuries caused by a sharp weapon. The police lobbed three teargas shells after caning failed to disperse the mobs. In all 17 persons from both communities have been arrested on charges of rioting and arson after combing operations in the sensitive Fatehpura and Yakutpura areas, the police said here today. India today denied that it had received the modified version of the SU-30 MK-I fighter aircraft from Russia. An IAF spokesperson here said they were still to get the physical delivery of the SU-30 MK-I aircraft here in India. He said the knocked-down kits of the fighter aircraft were still to arrive here. Reports from Moscow had suggested that Russia had started the delivery of the fighter aircraft and that the first two were shipped to India on board a Russian cargo plane on Saturday by the Irkutsk-based Iapo Aircraft Corporation. However, the IAF spokesperson said the cargo was still to reach India and that there was no news of where it was. India is to get the delivery of 10 modified versions of the SU-30 MK-I aircraft from Russia between now and December. The arrest of Sudip Chongdar, PWG Secretary of Midnapore unit, from Jhargram a few days back, led to nabbing of four others last night, District Superintendent of Police K. C. Meena said. All four naxalites, including PWG state committee members, Partha Banerjee and Mithu Roy, were arrested from Belgharia in North 24 Parganas. The police had information that the five maintained links with the PWG in Orissa, Jharkhand, Bihar, Andhra Pradesh, he said. The locomotive, manufactured in 1855, set off the journey pulling up two air-conditioned coaches here after the local Lok Sabha member Jaswant Singh Vishnoi flagged it off at the local railway station this morning. The nostalgic journey has been organised by the Jodhpur division of the Northern Railway and the National Rail Museum to commemorate the 120 glorious years of opening of ‘Bitoora-Marwar-Pali railway line, built by the erstwhile Jodhpur railway, for traffic on June 24, 1882. Bitoora railway station is now known as Marwar Junction. District police chief, Dr G K Goswami, said here that Kunwar Singh and his brother divided a plot of land between them but a dispute arose over the possession of a mere three inch area. Last evening Kunwar Singh and his sons, Umesh and Manoj, killed Kunwar Singh’s brother with sharp-edged weapons.